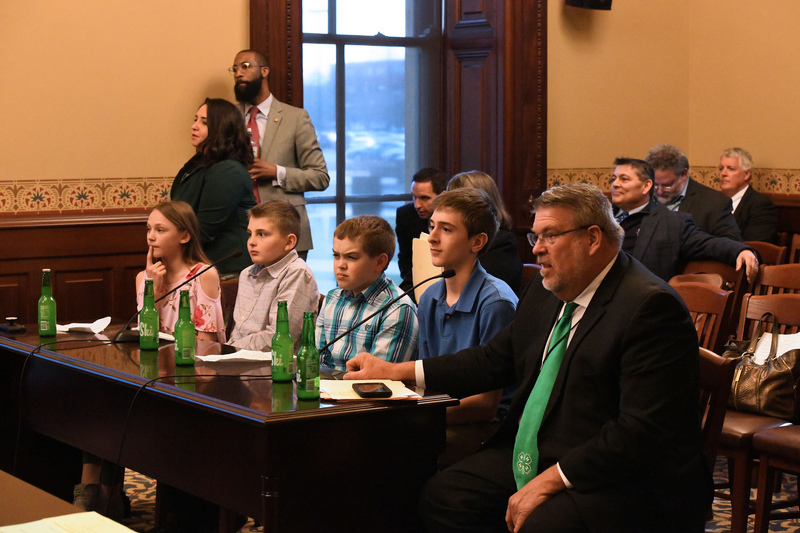 Students from Germantown Elementary visited the Illinois Capitol on Wednesday, March 27 in support of legislation they requested State Representative Charlie Meier (R-Okawville) to sponsor. The legislation would designate Ski as the official State soda of the State of Illinois. On Wednesday evening students from Danny Glynn’s social studies class at Germantown Elementary; Jordyn Robke, Garret Arentsen, Landon Holtmann, and Owen Huelsmann provided testimony in support of Rep. Meier’s legislation (HB 3073) to make Ski the official State soda before the House State Government Administration Committee. The student’s testimony received favorable feedback and helped the committee learn more about the thriving business located in Breese. In addition to HB 3073, Rep. Meier filed a resolution that was unanimously adopted by the House of Representatives to commend and celebrate the tradition of Excel Bottling (the makers of Ski soda) and wished them continued success in the future. Excel Bottling remains one of the few independent family bottlers in the nation and is currently managed by the third generation of the Meier family. Excel Bottling is the only returnable bottling line remaining in Illinois, and people still pick up soda and return bottles to the plant in Breese. Since 1961, Excel Bottling has produced a naturally-flavored citrus soda called Ski and has kept the same recipe, which uses pure cane sugar, for 58 years. The sweet and satisfying taste of Ski soda has garnered tremendous popularity in Illinois and the St. Louis area and is enjoyed by young and old alike.